With the growth of technology-rich environments in libraries, librarians find themselves supporting learning in new and creative ways, including mentoring the critical technical practices of youth (Hildreth, S., 2012). How might librarians help to develop in young people a critical, self-aware stance toward the technological artifacts that they make? Dialogue that occurs in youth maker spaces may be the key. 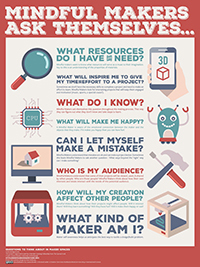 This project explores the intermediation between librarians and teens in maker spaces in relation to self-reflective question prompts, using a set of “mindful maker” question prompts identified in earlier research and then captured in a poster created for maker spaces for youth (Bowler & Champagne, 2015)1. This project takes the “mindful maker” question prompts into the field for two months in order to learn how to best integrate them into the professional practice of librarians. The research evidence will be gathered through participant observation, interviews with teens and librarians, and artifacts created by the young people who participate in maker activities at the Carnegie Library of Homestead. The goal is to produce a set of recommendations and evidence-based guidelines that will help librarians use question prompts to help guide critical technical practices in maker spaces for youth. This NSF EAGER project explores in a novel fashion an emerging phenomenon of significant importance to academic research. Public academic information resources on the social web are growing in size and number at a very rapid rate. The goal of this project is to develop a quality assessment and an association discovery framework for online academic information, and ultimately to establish a novel framework for supporting researchers in accessing, organizing, utilizing, and exchanging all types of academic information. The proposed assessment framework will utilize the rich behaviors expressed in social reference data to design quality assessment measures that are tightly connected to the new data. The framework will utilize publicly-available academic information on social reference sites, and examine association rules that connect two articles based on time periods, topics and social-network based measures. The dynamic information environment of the web adds considerably to the challenges associated with this research. However, if successful, the results will be of considerable value to many communities of domain researchers. In many areas of human professional and social life, people tend to form more or less clearly defined communities. The main problem of these hidden or latent communities is that they are really hard to discover since the borders of these communities cut through various professional and organizational borders. The modern social Web, however, provides a huge volume of alternative data sources for discovering latent communities. The goal of this NSF EAGER project is to explore a range of promising approaches that can be used to elicit latent communities from various kinds of data about individuals available in the modern social Web and deliver the results for human thinking and interactive exploration through interactive visualizations. The visualization provided will allow humans explore and manipulate the results delivered by the new algorithms. This will deliver results that are produced by the joint power of human and artificial intelligence. In the course of the project, the team will build several data sets combining data of several social Web systems and use these data sets to develop, evaluate, and compare several elicitation and visualization approaches. The work will advance the research on latent communities, community and user modeling, and interactive social visualization. At the same time, the work will constitute one of the first attempts to use a variety of social Web data and a variety of approaches for community modeling. To increase the broader impact of the project, the researcher will apply the latent community knowledge to several practical tasks, such as identifying proper academic mentors and forming coherent collaboration groups. They will also engage a number of students in the research advancing their training into this emerging field. In 2008, Dr. Lewis received a grant from the Air Force Office of Scientific Reseach to study large-scale human computer interactions. Large networks of human and machine systems assembled in network-centric warfare have staggeringly complex properties. Many of these poorly understood and difficult to predict properties emerge from large-scale interactions and may be positive or negative. On the one hand, the indisputable strength of human decision makers lies in their ability to filter through noisy information and rapidly focus on relevant information. This ability is as yet unmatched by any automated or formal systems. However, humans trail far behind automated systems in processing vast amounts of information. This naturally leads to the promise of a synergistic human-machine system for decision-making: one which combines the raw horsepower of a machine’s ability to process data with a computational cognitive model of human decision makers including their ability to isolate relevant information. However, synergies are not inevitable if humans are inserted into complex interacting networks that focus solely on information processing prowess and ignore human weaknesses. Such impedance mismatches between producers and consumers of information can be a recipe for disaster. The overall research goal is to develop validated theories and techniques that will allow study and prediction of behavior of complex and large scale human-machine systems. This includes the development of a methodology for the study of such systems so as to ensure validity and comparability of performance results. Dr. Cox posits that our initial sense is to accept that war and its destruction is bad for cultural institutions such as archives, museums, and libraries. After all, these institutions are prominent symbols of particular communities and cultures and are often targeted for destruction by the enemies of these groups. Yet, war also generates the creation of archives, museums, libraries, monuments, and historic sites. In this contradiction may be found the critical elements for understanding why the archival impulse, the effort to save evidence and information documenting the past, is both so important to society and often difficult to understand. This brief monograph intends to explore the rich scholarly and other literature grapping with the meaning and impact of war and to consider what war suggests about archives and society. There is discussion about the meaning of war, the archival mission, war memorials and commemoration as archives, the preservation of personal papers and artifacts and the meaning of the fragility of war documentation, government and the making of official war archives, cemeteries as archives, terrorism and new challenges to remembering war, the future of archives in war and memory, the strange relationship between technology, war, and memory. Dr. Hirtle has been awarded a travel grant from the University Center for International Studies’ UCIS Grant Program for Faculty Research or Teaching in Germany. The grant will support his travel to the University of Augsburg where he will collaborate with Professor Sabine Timpf. Hirtle and Timpf will examine the theoretical issues and practical applications involved in understanding how humans represent spatial information and how that information should be encoded in advanced information systems. They will look at the role of granularity for spatial information systems in general, and navigation systems, in particular. The proposed research will develop a taxonomy of spatial locations based on the theory of spatial landmarks (Sorrows and Hirtle, 1999) combined with the theory of spatial granularity (Timpf and Kuhn, 2003). The newly-developed taxonomy will guide the researchers to the appropriate negotiations between the system and user, as well as the encoding of past events to determine user histories and preferences. Timpf and Hirtle hope to create new models of spatial information which will benefit the next generation of navigation systems. Results of this project may be showcased at future international conferences and in academic journals covering the spatial information field. Currently, Dr. Cox is preparing to write a book on the work of Lester J. Cappon (1900-1981). Cappon was a leading historian, archivist, and documentary editor who played important roles in the shaping of all three fields in the mid-twentieth century. Cappon’s main contribution to the archival community was in his writing a series of important essays on archival theory and practice. Working with Cappon’s personal papers at the College of William and Mary, Cox selected and republished Cappon’s most important archival writings in a volume published by the Society of American Archivists in 2004. Knowing that Cappon’s personal papers would be opened in August 2006, Cox determined to do a follow-up essay about Cappon as a diarist, assuming that an investigation of his diaries would provide interesting insights into the historian and archivist as a self-documenter. Using Cappon’s diaries, along with several other important sets of archival documentation concerning the historian’s life and career, Cox is expanding his study to consider Cappon’s contributions to the understanding of the archival Impulse; the nature of diaries, the activities of the diarist, and the creation of records. The proposed publication will also consider Cappon’s often pioneering teaching about archival work, historical research, and documentary editing; his career as an early public historian; his work as a documentary editor; his ideas about and activities in scholarly publishing; and his personal collecting and how this affected his own career. The National Science Foundation awarded Dr. He a grant for $691,500 for this collaborative project with Yiming Yang from Carnegie Mellon University. The project, entitled "III-COR: Collaborative Research: User-Centric, Adaptive and Collaborative Information Filtering," aims to significantly improve adaptive filtering technologies by understanding how to learn from multiple users with broad applications in information retrieval. The results of this project will provide a significant contribution to the field of information search and to our understanding of how to effectively learn from multiple users. The project will also discern how to combine multi-aspect user information in a new unified framework, with broad applications in information retrieval (web-based and enterprise search engines, for example) by giving them a major adaptive and personalization dimension. Dr. Lewis was awarded $1.5 million in funding for two projects from the U.S. Department of Defense’s Multidisciplinary University Research Initiative (MURI) program. The MURI program supports research projects of interest to the Department. Lewis, whose research interests involve human-computer interaction, is working with researchers from four other universities on a project to discover methods for observing how cultural differences may impact negotiation efforts. The results may be used to train military negotiators. For the second project, Lewis is also working with faculty at other universities to evaluate the benefits of a decentralized military information network. The negotiation research project will help military personnel to better cooperate with people of different cultures. It is part of a larger project to understand the factors that lead to success or failure in negotiation and cooperation. Researchers from Carnegie Mellon, the University of Michigan, Georgetown and the University of Southern California are participating in the project. Lewis and the University of Pittsburgh team are developing a browser – based negotiation environment to better account for distance and language issues. The Pitt portion of this project is $600,000. The second project is exploring the feasibility of a decentralized military information network; the team involves researchers from Carnegie Mellon University, Massachusetts Institute of Technology, Cornell, and George Mason University. The researchers are developing and evaluating a military communication system that will utilize a peer-to-peer network outside of the chain of command. While this might allow soldiers and robots to communicate and react more efficiently to changing situations, there is the possibility that the decentralization might result in confusion for the troops. Lewis and the Pitt team are evaluating the strengths and weaknesses of the proposed network as it relates to how the teams of soldiers will interact with the communication system. The entire project is funded for $7.5 million; the Pitt portion is nearly $1 million. Prashant Krishnamurthy and David Tipper are part of a research project funded by the Army Research Office’s Multi-University Research Initiative. They are investigating how to construct robust and secure mobile ad hoc networks. "ARSENAL: A cross layer ARchitecture for SEcure resilieNt tacticAL mobile ad hoc networks” is a joint effort of 12 professors at 7 institutions: University of California, Davis; University of California, Santa Cruz; University of California, Riverside; Brigham Young University; University of Utah; University of Pittsburgh; and the Pennsylvania State University. The Army Research Office funded this innovative project for a five-year period at $6.25 million. The goal of this project is to develop a cross layer architecture that provides comprehensive security and resilience for mobile ad hoc networks. The resulting architecture will be able to adaptively provide the appropriate trade-offs between performance, security and fault-resilience. Because Pitt is one of the top public research institutions in the world, iSchool students can do research projects with faculty members who are at the leading edges of their disciplines.